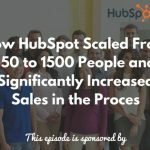 Home » TSE Podcast Post Page » TSE 728: How to Grow Your Business by 15% in Just 15 Mins Per Day! Scared of calling? Well, I hate to break this, but if you want to make more sales and grow your business, you’ve got to pick up the phone more and communicate with your prospects. Alex Goldfayn is the author of the book, The Revenue Growth Habit: Simple Art of Growing Your Business by 15% in 15 Minutes a Day. 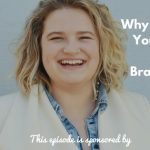 He breaks down selling and marketing, how to get your message out there in simple, bite-sized chunks. This makes it so easy for us as business owners and entrepreneurs to try these things. We avoid using the phone because we’re afraid of rejection. Many salespeople spend only 4 hours a week on the phone. Call people some more to pay you some more. We think people are getting called all day long, but everybody else has the same fear of calling this person as you do. So these prospects are getting almost no phone calls. 1. Tell them you’re thinking about them. Ask them what they’re working these days that you can help them with. After asking this question, be quiet. Let them answer the question. Guess what? They will tell you because they’re grateful you’re calling. All customers really want is to know that we care. 2.Don’t make them look stupid, to their customers and to their colleagues, and to their boss. If you show people that you care, literally you’re doing 95% of the sale, on the spot right there. Alex’s book has 23 different techniques like picking up the phone. A typical customer only knows about 20% of what they can buy from you. We don’t offer our other products and services because we’re guessing they don’t need it. The truth is they’re buying from competition when they could be buying from knew, if only they knew you have them. And even if we tell them, some of them still don’t know. The book also focuses on the right mindset in order to take these actions. It also focuses on relationships, how we help people, what we do for people, how we say it, and how we make money. 1. The key to growing your business is know how good you are and behave accordingly. Pick up the phone. Ask for the business. Ask questions. 2. Communicate case studies to people who can buy from you. Having a case study or testimonial is one thing. But communicating that case study and selling with it is another thing. Try to link in the customer into the case study or testimonial. Most of the time, the customer will say yes or you get silence because they don’t like to say no. 1. First is to confirm that they got the proposal. First one should be sent within 24 hours of sending the proposal. Just write one line and then send it. 2. Use your timing based on when you think it will close. 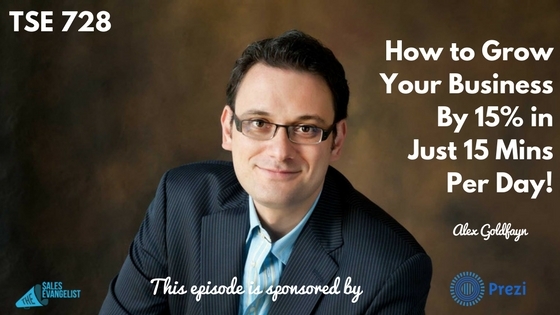 Use your judgment based on how long your sales cycle is with this customer. Send just one line. 3. Bring out the expiration date in your final followup. Check out www.goldfayn.com/TSE and get your download Alex’s second book for free.